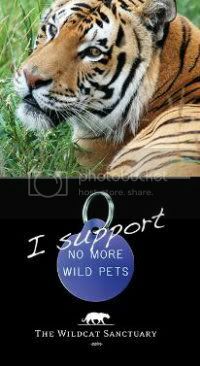 UPDATE VIA ALDF – June 20, 2014: Louisiana Governor Bobby Jindal has signed “SB 250”—a bill exempting the owner of Tony the Tiger from existing Louisiana law that prohibits private possession of dangerous and exotic large cats. That 2006 law was passed unanimously by the Louisiana legislature and was drafted by Rep. Warren Triche, Jr. specifically with Tony’s plight in mind. 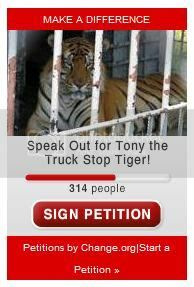 Michael Sandlin, owner of the Tiger Truck Stop, pushed for this controversial bill after several Louisiana courts rejected his permit to keep Tony caged as a gimmick in a gas station parking lot. This bill grants preferential treatment to one individual and has outraged Louisiana residents concerned with public safety and drawn criticism from animal welfare advocates across the nation. The Animal Legal Defense Fund believes this law is unconstitutional and plans to immediately challenge its validity. Here is a list of contact information for Gov. Bobby Jindal. 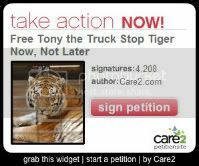 PLEASE TAKE ACTION NOW for Tony and ask Gov. Jindal to VETO SB 250. Please keep letters, emails, phone calls, etc. on point and polite. 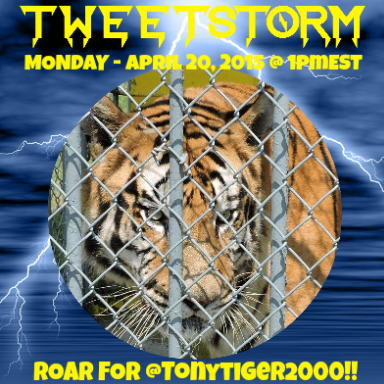 Please share this post with share buttons below & KEEP ROARING FOR TONY!